If you haven’t been over to Port Townsend to visit the Water Street Brewery and Alehouse, you’re missing out on a treat. The pub oozes personality. The beer is incredible. The proprietors are really great people with roots that sink deep into the Washington beer landscape. 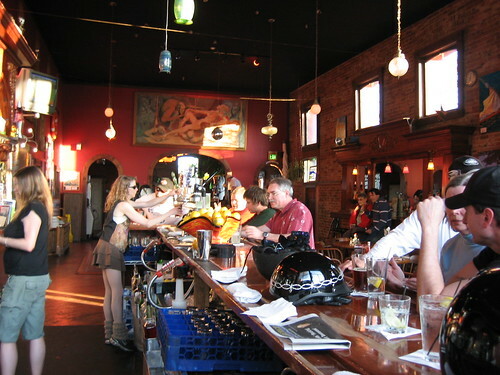 The pub itself is located in one of Port Townsend’s most beautiful and historic buildings. We simply cannot say enough good things about Water Street –the place, the people, and the beer are all great. These troubled economic times have proved especially difficult for our friends at the Water Street. Nina, Skip, Mark and the rest of the Port Townsend crew are asking for our help. They have come up with some creative ways for Washington beer lovers to show their support. This Sunday, March 8th at 2:00 PM, they will hold a silent auction for some awesome stuff. Come out to the pub and place a bid or two. You can still contribute items to the auction as well. They’ve come up with a way for you to pledge your support. Check out the Pledge Form. They’ve come up with a way for you to invest. Check out the Share Agreement. Contact Water Street via phone (ask for Nina) or email if you have any questions, or if you’d like to donate something for this Sunday’s auction. They’d love to hear from you. We’re hosting a silent auction on Sunday, March 8th to help us keep the doors open. Already we’ve received tremendous support from the community of Port Townsend and all who have participated in the revelry that Water Street Brewing has become known for during the last five years. We are still in need of support and are requesting donations from any of those who may be able to help our cause. Your donation, whether it be a good or service, piece of art or other collectible, will be auctioned off Sunday, March 8th with all of the proceeds going to aide Water Street Brewing during this critical time. We’ve created a variety of options for you to show your support and help us continue to serve Port Townsend and all the visitors who come to the Olympic peninsula every year. Beyond donations to the auction, we are offering pledge sheets. Each dollar pledged will be repaid to you from the brewery in the form of goods or services. Some repayment options include five course brewer’s dinners hosted by the Brewmaster, private parties for your staff, family or friends, beer subscriptions…fill your growler each week with your choice of brew. We’ve also decided to publicly offer shares in the business, so it truly becomes your extended living room. Please check out our website for more information. We believe strongly that with your help, we will raise enough money to keep the beer flowing and the party growing for the long term. Thanks for your consideration!